Seana Bhraigh, one of the remotest Munros, lies in a vast wild area in the Northern Highlands. To the east the land is part of the huge Alladale Estate, which the current owner, millionaire business man Paul Lister, wants to turn into a safari park with wolves, bears, elk, lynx and other animals that once lived in the Highlands. The low ground of Alladale is badly overgrazed by red deer with few trees and no forest regeneration. Lister intends on restoring the forest, which will be essential to provide habitat for the animals. Now all this is admirable. I'm very much in favour of forest regeneration and the reintroduction of wild animals, as long as the habitat is suitable. However Lister also plans on keeping the animals on his estate by means of a high electrified fence and then charging visitors to enter. This would end free access to the estate and put Seana Bhraigh out of bounds. It would also mean an unspoilt wild area would be sullied by the fence. This isn't restoring a wild area but making a safari park. True re-wilding, to use the current phrase, would not involve fencing. So far Lister has enclosed a 400 acre area and successfully applied for a dangerous wild animals licence. He is also doing a great deal of PR for his scheme - most recently a feature in The Observer newspaper. Fencing Alladale would be illegal under the Land Reform Act which gives a right of free access to land in Scotland. I cannot imagine that the Scottish Executive will allow his fence to be built. Indeed, it is outrageous that a landowner can act as though he can do this without needing to bother about the law. However I still think it is necessary to counter his PR and point out that the fence is against the access legislation and will be an eyesore. To that end I have written to The Observer about their article. I suggest others do the same. Those in Scotland could also contact their MSPs and Ministers, those without Scotland could contact the Executive. Seana Bhraigh is a wonderfully wild hill. 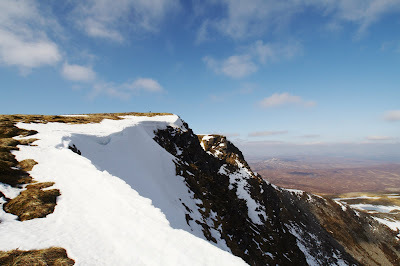 I was up there in March for a few days, camping by frozen lochans and climbing over the last snow fields of the winter. Not far from the summit, at a height of 3000 feet, I saw a badger foraging between the patches of snow, the first time I've seen a badger this high and this far from woodland. A fence up here would be an insult to nature. The photo shows the summit of Seana Bhraigh in spring. Photo info: Canon EOS 350D, Tamron 11-18mm lens at 11mm, f8 @ 1/640, ISO 200, raw file processed in Capture One Pro. The 3m fence around the rich celeb reserve is bad news, but worse - it needs to be secure. Heavy snow, strong winds and general "vandalism" by high altitude winds will take a toll. Lister has said in answer to security concerns that it would be patrolled (he also needs to keep us out remember). To patrol the fence will require a road along the fence, so we will also be getting a nice big road around the hills as well - thoroughly industrialised. Also away from the Munro madness - glen walkers are badly affected to. The famous cross Scotland walk down Gleann Mor ( a right of way?) will be severed. As will the fine routes up Strath Vaich. Deanich Lodge is in Jurassic Park too.